Breast cancer awareness month isn't until October but here at Valley Fabric Shop it is this weekend. Caring for ourselves is so important. Often times we put ourselves last but when it comes to our health and well being, we need to remind ourselves that we MATTER! We are not just talking about breast cancer but all cancers, all health issues both physically and mentally. We see each one of you ladies sometimes several times a week, sometimes once a year but we want you all to know, WE CARE! Come celebrate this weekend- April 8th and 9th with 20% off mostly pink fabric (1/2 yard cuts or more), the Mammobile, the Glamorous Glamping Gals quilt kickoff (with a real Glamper) and of course Bobbi, Christy and Diana's birthdays. Hot dogs, and cake will be served! The Mammobile will be here from 8:00 to 3:00 pm but the activities will be all day long! 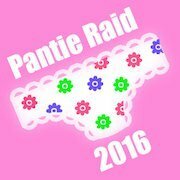 The Pantie Raid has started! Don't forget to grab some new undies, bras, socks, pj's to donate to the women in our community that are in need. All items will be taken to SAFV. These women put their kids and families first and sometimes just having a pair of new undergarments can really lift your soul. Be part of this Glorious Group by making all things Glamper! We will be having a get together on May 14th at 10:00 am. Bring your Camping kit and enjoy friendship, piecing and treats. We will show you some tips and tricks to put your camping quilt together. Need some extra Glamping inspiration? We will have an old camper that has been refurbished into a Glamper here at the store on April 8, and 9th. Her name is Bette Voncille and you can come inside and take a look. We will be having Carmen Geddes with "Ten Sisters" here for a Trunk Show on April 14th at 6:00 pm. I was just reading in her book the following and how fitting it is to have her this next week. "Throughout time, women have gathered. We help and support each other and enjoy each others' company. Even when our lives are busy, quilting is a wonderful way for us to connect with each other. I've seen lifelong friendships begin and flourish all around the country because of quilting!" Wow, what a statement and it is so true! 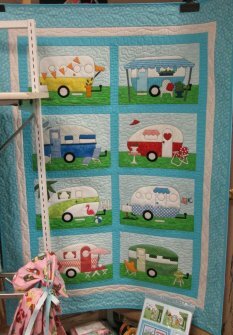 Come take a look at her quilts along with seeing her "Easy Piecing Grid." 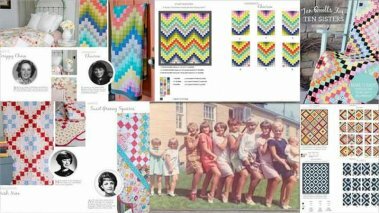 She really makes hard quilts easy to put together and you won't even have to tell anyone your secret! The Trunk Show starts at 6:00 pm. The fee is $10.00 per person to sign up then after the class you will have a $10.00 store credit to use. Fees are nonrefundable and must be used that evening. You can sign up and pay online if that works better for you. This is one trunk show you don't want to miss!